Even the smallest of experiences can reveil something great and unexpected. This recently happened to me when checking out the Costume and Textiles Study Gallery at the Philadelphia Museum of Art. There were a few pieces by Francis Toscani exhibited under the motto: ‘Tailoring Philadelphia: Tradition and Innovation in Menswear‘. Until that day, Francis Toscani had not been a name that rang a bell to me, but this has changed. I love his craft and for his time he seemed so avant-garde and still contemporary nowadays. I’m impressed. Man's Jacket/Tunic, c. 1968. Designed by Francis Toscani, 1915 - 1973. Brown and gold plaid polyester knit. Philadelphia Museum of Art, Gift of Mrs. Francis Toscani, 1974. Drawn from the Museum’s rich collection of menswear, this exhibition focuses on one of Philadelphia’s most important industries in the late 19th and early 20th centuries: tailoring. Curated by Kristina Haugland, Associate Curator of Costume and Textiles, more than fifteen garments created by Philadelphia tailor Francis Toscani (1915–1973) are on view, supplemented by a selection of works by other local tailors. These pieces—including a frock coat, morning ensemble, and dinner jacket—illustrate the traditional forms of men’s suits in the early- to mid-20th century. Man's Jacket with Removable Peplum and Insertable Pocket Flap, c. 1967. Designed by Francis Toscani, 1915-1973. Ivory silk slubbed plain weave. Philadelphia Museum of Art, Gift of Mrs. Francis Toscani, 1974. As a child, Toscani learned the art of tailoring from his father, and by the 1960s he was chief designer for H. Daroff and Sons, one of the nation’s largest manufac­turer of men’s apparel, producing more than 1 million men’s suits each year under labels such as Botany 500 and Worsted-Tex. Toscani’s designs often challenged the conventions of traditional tailoring by incorporating unusual sleeves, pockets, and collars; interesting seaming and closures; and unexpected colours. 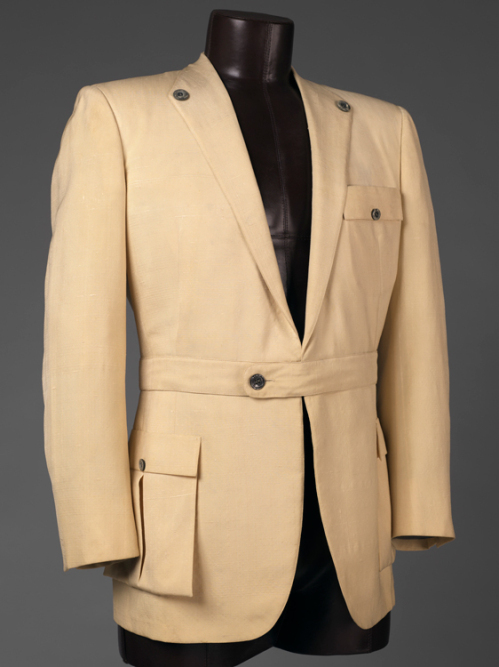 Among the designer’s inventions is an ivory silk safari jacket (c. 1967) that converts via waist zipper to a formal mess-style coat. 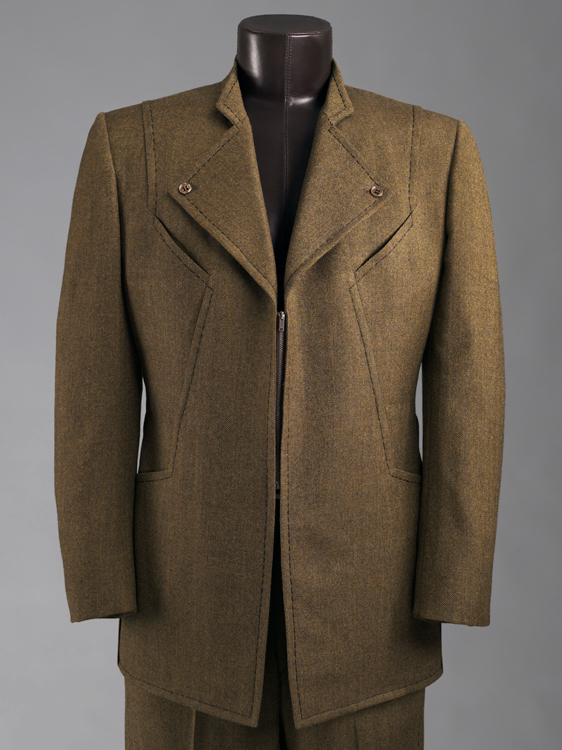 Toscani’s keen understanding of the nuances of men’s clothing styles is most apparent in his designs created especially for fashion shows, such as his “Half and Half” Suit (c. 1962–65), a pale grey suit that features the cut and details of early 1960s fashions, executed in dark brown. 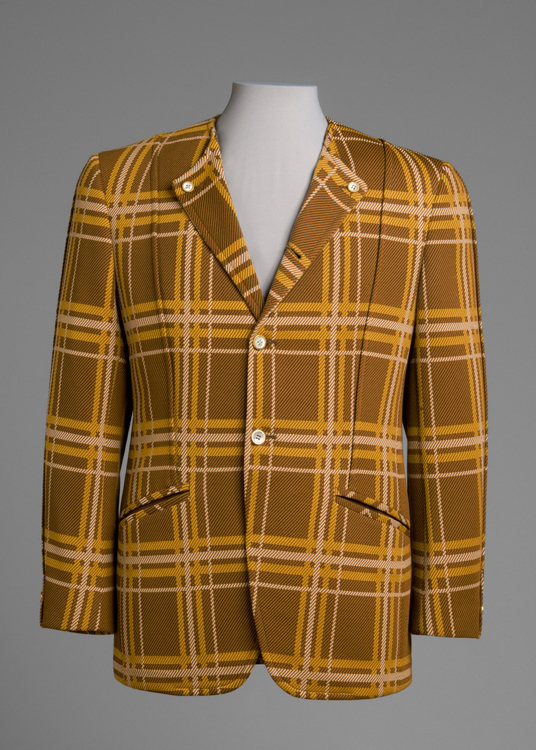 Man's Suit: Jacket and Trousers, c. 1969. Designed by Francis Toscani, 1915 - 1973. Olive green/brown wool twill tweed. Philadelphia Museum of Art, Gift of Mrs. Francis Toscani, 1974.